Every goddamn day: 04/22/19: Happy mother's day, ma. 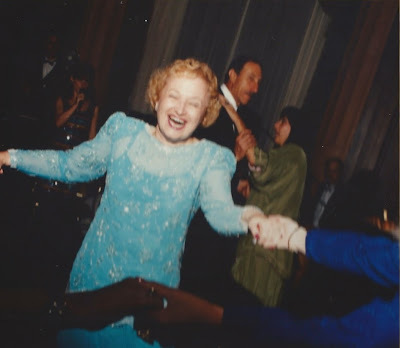 My mother, dancing at my wedding. Not that she ever says that, and maybe she doesn't even think it. I do. I talk to her almost every day, just to check in, see how things are going, hear the news of my various relatives who would never contact me for any reason whatsoever, but whom I shared a living room at my grandmother's house at various celebrations in Cleveland 40 years ago. I think we've grown closer these past few years because, now that the boys are in their later teens and flying the coop, I begun to realize just how big a hole it kicks in your life when your kids march off. I've also realized how we both share an unquenchable need to talk, one that we can satisfy on the phone to each other, almost every day, and thus spare our acquaintances the obligation. Anyway, I shouldn't go on too long, because I have this tribute that I ran in the paper 14 years ago, that I believe sums her up about as well as I can. My mother is in Finland today. At least, I think she's in Finland. Could be Norway. Or Denmark. I'm not really sure. My brother has the itinerary, and just as soon as I can get around to it I mean to find out, so I can call her up and wish her a happy Mother's Day, and she can tell me whatever she's doing there. Looking at fjords, I suppose. Then I'm heading off for the big barbecue at my in-laws. I don't write about my mother much, simply because our relationship is hard to explain. It doesn't fit the classic Victorian stereotype mother; son image -- you know, dear old mum in a calico dress, her white hair up in a bun, sitting in a rocking chair before the fire, knitting warm socks for her boy, who at that moment is penning her a letter in his tent outside of Vicksburg. "Dearest mother: How my thoughts turn toward your sainted self as we prepare for the Great Battle. . . ."
We aren't like that. My mother and I enjoy -- how to say this? -- a certain earthy candor that doesn't translate well to outsiders. We speak our minds, and it isn't always pretty. She said something a few months ago that illustrates the situation well. We were talking on the phone, and out of the blue my mother said: "You know, Neil, your father and I were discussing it, and we decided that you really are the star of our family. . . ." Here she paused for a moment, then added, with a sigh, "Of course, considering how your brother and sister screwed up their lives, I suppose that isn't saying much." Maybe that strikes you as a hurtful sentiment, but I loved it, just loved it, because it says so much about my mother; her yearning toward some sort of cliche sense of grace -- to have the kind of family that has "stars" -- slapped down by her inevitable cold clear view of the world. Her remark also explains how I ended up the way I am. People sometimes wonder how I can blurt out these harsh, uncharitable assessments, regardless of the setting or effect on my popularity and career. After they meet my mother,they don't wonder about that anymore. Your mother creates you, both literally, in the birth process, and figuratively, in the years that follow. My mother is so much like her mother, Sarah, who was the star of her little poker-playing, choir-singing, department store-clerking world of Jewish ladies in Cleveland. Sarah's been gone more than 20 years -- hard to believe -- but I can still see her, telling me about a special senior citizens episode of "The Price is Right." A woman who had worked in Hollywood in the 1930s was on the program, and the host asked her if she had any regrets in life. She said she had worked as a makeup artist on a Clark Gable movie once. The famous actor had asked her to go to bed with him, and she said no. "Of course she should regret it," my grandmother snapped, staring ahead coldly. "The woman's a fool. I'd have said, 'Just wait until I can get my clothes off.' "
That shocked me, at the time. ("Grandma!" I said.) But now it's my most treasured memory of her, more than the Thanksgiving dinners or the Hershey bars she kept in her purse for us. That's who she was, a dame. My mother ended up a dame, too. At least she isn't dull. I wasn't always able to appreciate my mother's brio, her chutzpah, the way she marched up to store clerks; teachers; policemen and gave them a piece of her mind. But now I do value it, just for its rarity. Most people are so timid. Not her. My mother once was visiting me in Chicago -- she visits once a year or so, when she isn't in Scandinavia or Hawaii or Australia or someplace a lot more interesting to her than the Midwest, clotted as it is with sons and grandchildren -- and I took her to Andy's, the jazz club; bar on Hubbard Street. It was dark, noisy, crowded, a small band grooving on the stage. My mother excused herself from the bar -- I assumed to go to the restroom. The next thing I knew, she was up on stage, with the band, singing some old chestnut. "Goody-Goody," I believe. That brashness is typical of her. When Northwestern officials slashed my financial aid, senior year, a ploy they used assuming that students would find the money somehow and not transfer away with one year left, my mother grabbed the phone, announcing she was going to call and get the money back. I can still see my 20-year-old self squirming, trying to stop her. "Ma, don't call the school. You can't change things like that." She did call. And she got the money back. This all is my way of saying, cut your mom some slack this Mother's Day. Sure, she can be intolerable -- most mothers are, to a certain degree. But they also have their glory, and you will miss them someday. A number of years ago, my mother and I were in Cleveland. We were driving near the cemetery where her mother is buried. As we passed the cemetery, my mother rolled down the window, leaned out and let loose with a blood-curdling scream of "MOTHER!!!" It shocked me then and continues to do so to this day, just the sadness, the loss, the passion in that cry, something from the inner core, from the child that remains within all of us, all our lives, turning toward our mothers for that thing we have lost and want back. Very interesting family history. I believe in being blunt as well and standing up for what is right and confronting when necessary-that's Italian. More women need to do that and stop acting like doormats. Though my mom wouldn't have gotten up on stage. (Hope your siblings didn't read the column about what your mom really thinks of them.) Sometimes it's easier to dish it out then take it though. By the way, you look a bit like your mom just around the eyes. P.S. That is dirty pool of Northwestern to do that. My bro went there but didn't have any such problem, even though he was on aide too. Also, that's a good son who calls his mom often. But he went to school later then you did. Now my Italian mom would say (and I agree) disgagreeing with your grandma: Of course you shouldn't sleep with a guy who just wants to use you for a roll in the hay, no matter who he is. What's with the President and the Pacific trade deal? Has he sold out to corps. I like Elizabeth Warren's view on this. Mr. S, would love to hear your views on this. I wouldn't. Not his thing. I meant to Mr. S, I'd love to hear his views on this. Love the photo of your Mom dancing. A nice, warts and all but affectionate for all that, rundown on the Steinberg's. The brashness you personally lay claim to may indeed be hereditary, but does it not also come with your chosen occupational territory? Few professional writers end up being entirely beloved of their kin. As William Faulkner put it. "If a writer has to rob his mother he will not hesitate: the 'Ode on a Grecian Urn' is worth any number of old ladies." Nice that you call the old dear daily, and I wish I had done something of the same when my mum was still around. But that was some time ago, and I was probably still somewhat captive to the notion that placing a "long distance call" meant someone had died. In these days when one might think nothing of picking up a cell for a call to Hong Kong that's a problem many of your readers might be too young to credit, but it was once the prevailing mindset, one the advertising agency I once worked with created a campaign for AT&T to undue. It was called "Joey Called," after the theme ad, which featured a father telling his wife he'd taken a call from their son, who was away at college. "What's wrong," she asks, with a look of horror on her face?" "Nothing," the dad says, "He just wanted to get in touch." Thanks for the Faulkner quote. LOL moment, among precious few. Though Neil is certainly to be commended for his daily phone calls, I also marvel at the difference between how we viewed calls back in the day vs. today. The funny thing to me is that evidently many of today's yutes don't even WANT people to call them, as calls are too much of a nuisance. I did it to make the little red line go away. Damn Spellcheck! Jack, you are correct on some seeing calls as a bother. It's a sad commentary today indeed. It makes me feel old, not to enjoy or use texting much, even though I'm not. That was brought to life well in the movie "Long Hot Summer " with Paul Newman and his soon to be 2nd wife Ms. Woodward. Though I'm the same age as one of his daughters, I just love early day Mr. Newman fare. Whoo hoo, love that Ben Quick- and it made me appreciate Amer-Hungarian/ Polish Jews more after that. Ya gotta love those pale , Slavic eyes. Unfortunately , with some elderly, they are fine and travling round one minute, then the next can barely get around- it happened to my own folks. Like Will Varner in the guise of Orson Welles said in that film, " I think I could live forever." Pardon a missed comma in a post further up some where, just typing and posting too hastily. Any other Newman fans here? Tom, no excuse, even back then a call on special days wasn't just for bad news. You should hve called more, no excuse. Silly comment. Of course I called on special days. Sandy, Exactly, too much of that too these days, with the texting. Refuse to use the self check out lane , even if can- I get a discount if I'm to do own work! I don't remember reading this column the first time around. Very well written. I thoroughly enjoyed it today. Thanks! Nice, sounds like Auntie Mame.